As we all know, to stay on track with our fitness and overall health it is important to have specific goals to work towards. Here are three key steps to maximize your fitness goals while making an impact beyond just your own accomplishments. We all want to be in the best shape possible whether it's to meet our aesthetic goals, enhance sport performance or improve our overall health. As we all know, to stay on track with our fitness and overall health it is important to have specific goals to work towards. One of the most frustrating obstacles to goal attainment is a lack of motivation and the realization that you've hit a fitness plateau. That point where your results have come to a halt and your efforts begin to seem pointless. More detrimental that hitting that physical plateau is when you reach a mental plateau. At this point your routine becomes predictable and monotonous, negatively impacting your energy, commitment and program adherence. This is the point where most people lose sight of their direction, drop off their routine and ultimately fail to accomplish their goals. Here are three key steps to maximize your fitness goals while making an impact beyond just your own accomplishments. Align your Goals with Tangible Events. It is human nature to become complacent when the stimulus becomes the norm and you lose that sense of inspiration. Everyone's fitness journey is susceptible to the consequences of hitting a plateau. My personal approach and recommendation to minimizing the duration of fitness plateaus is to align your fitness goals with tangible events. Fitness programs should be revamped at a minimum of every three months to provide a new stimulus and renewed direction. Planning out your year with one tangible event per quarter is a great way to stay on track, change the stimulus and experience new breakthroughs. Whether your goals are aesthetically driven, performance driven or purely health related, we all want to look, feel and perform at our best. One of the largest obstacles to making this a reality is the eventual lack motivation for your goal. Motivation though inspiration is a concept that rings true for me and my fitness endeavours; you can't maintain motivation without inspiration. The problem is, that initial inspiration of losing weight, gaining muscle or rehabilitating an injury is short lived. Once you lose that initial inspiration your momentum is stifled and you fall short of your goals. Always take the time to reflect on what truly inspires you. What type of activities or classes have you always wanted to try? Perhaps you can team up with a partner who has similar interests to increase your level of inspiration. Maximize Purpose Behind your Goals. Consistently attaching your goals to a tangible event that will challenge your habits serves as a great instigator to get you moving and keep you moving. Aligning an altruistic purpose to your event takes it one step further by bringing a much deeper meaning to why you are preparing for that event in the first place. This deeper meaning not only creates more drive and motivation with your exercise efforts but also has a larger impact of inspiring others along the way and helping others in need. Everyone can choose an event that is of interest and personal meaning. Running events like the Sporting Life 10K can be part of your annual spring fitness goals. As one of Canada's largest and fastest races, the energy of over 30,000 people is absolutely infectious! Knowing that you are supporting Camp Ooch, an organization that helps send kids affected by cancer to camp, adds so much meaning to this accomplishment. If you are not a runner there are other events that you can involve yourself in. Sweat 4 SickKids is an annual event at the Metro Toronto Convention Centre that brings fitness enthusiasts together to experience a fitness expo and two days of amazing workouts from the cities top trainers. Proceeds support initiatives led by the SickKids Foundation. 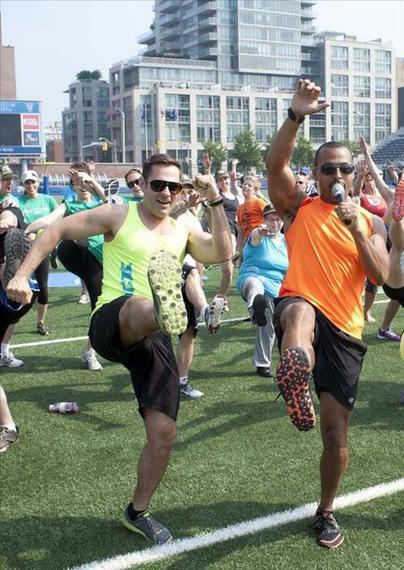 Kick it Up for Kidney Cancer is an annual fitness boot camp held outdoors at Toronto's Varsity Stadium. This boot camp allows you to register as an individual or team to experience 3 of Toronto's top trainers along with host and Canadian R & B sensation Jully Black. The variety of workout routines are comprised of yoga, strength training, partner exercises and athletic conditioning, geared to all levels and ultimately based on fun and involvement. The event is part of a national fundraising campaign to get Canadians moving in support of Kidney Cancer Canada. Selecting a charity event that has meaning to you is a powerful way to gain fitness momentum. 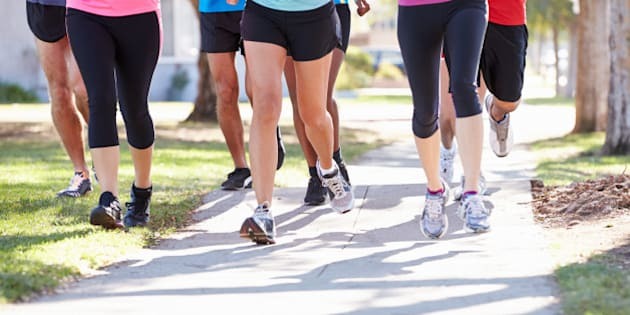 Even if the event date doesn't work with your calendar, there is nothing stopping you from still training for the event with the goal of raising money for a good cause; all the while enhancing your own personal fitness.